Studio Athletica | Downtown Toronto Hip Physiotherapy - Call Now. Below you will find a list of some conditions that we see with our Downtown Toronto hip physiotherapy clientele. At Studio Athletica, we specialize in several different services that can help treat your health problems. Please feel free to read more about your symptoms, conditions and our suggested treatments, or contact us to pinpoint the best treatment to heal your body. 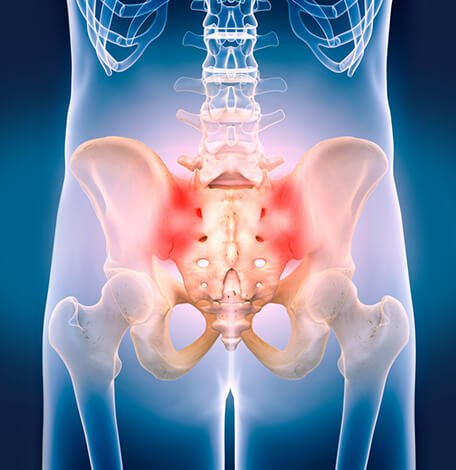 Our Downtown Toronto hip physiotherapy program sees a lot of sacroiliac joint dysfunctions. The sacroiliac joint, also known as the SI Joint, is the joint next to the bottom of the spine connecting the sacrum with the pelvis. Having a dysfunction in this area is thought to cause low back or leg pains, including pain in the groin area. Although it can be difficult to diagnose and not always clear how the pain is caused, it is often thought that a change in the normal motion of the joint may be the reason. The condition is most common in middle age women and can be caused by either too much movement, like hypermobility, or too little movement, such as being fixated for longer periods of time.